I grew up eating my grandmother's potato salad -- skinless potato rounds smothered in a vinegar, dill and mayonnaise vinaigrette. 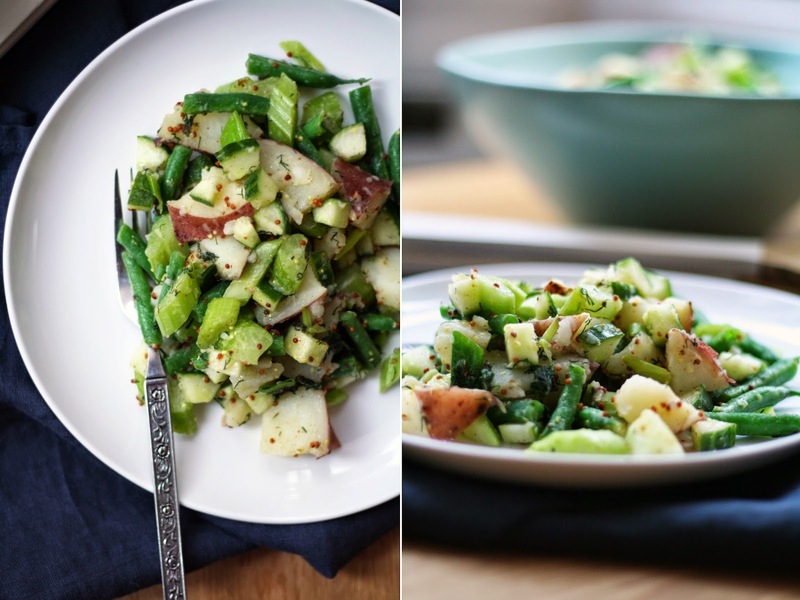 Though I'm a huge fan of Oma's recipe, one can never have too many summer salad recipes in their back pocket. Potato salads are great for large crowds at bbqs, travel well for picnics, and keep well over night so they can easily be made in advance. Last summer, I found a potato salad I really loved -- warm golden potatoes covered in all the herbs. I was determined to find an equally delicious contender this year. This potato salad, if I can even call it that because really, its only 1/4 potato, hits all the right notes -- crunchy, tangy, herby, easily eaten as a side or main and equally delicious warm or cold. Definitely the detox I needed after such a fantastic weekend. Place the potatoes in a large pot and cover with water, plus 3". Bring to a boil, and simmer for about 10 minutes, until fork tender. While the potatoes are cooking, prepare the beans, celery and cucumber and toss into a really large bowl (trust me -- this creates mass volume). In a small skillet, heat a dollop of olive oil over medium heat. Saute the green onions and dill for 2-5 minutes, until fragrant. Add to the bowl with the veggies. In a small glass jar, combine the dressing ingredients and shake vigorously. When the potatoes are ready, transfer to a colander and let drain to release any excess water. Once drained, yet still hot, add the potatoes to the bowl, dress and toss well. The potatoes will slightly steam the other vegetables, and absorb more flavour when hot. Serve warm (or cold) as a side, or for dinner topped with a soft-boiled egg.